Avebury is a great place to go, the energies are so soft and cuddlesome that when you walk about over the whole site, you are never far from been bathed in these healing vibrations, perhaps only the Avenue lacks something as I often feel that there is something missing when I walk it, but that is not to say that there isn’t dowsable energies there and those energies do have an effect, as I write this I can remember that actually walking UP the avenue feels like a trudge and it is not the slight slope that does that, but walking down the Avenue into the Avebury circle complex I tend to feel a slight exhilaration and that is always the same even though I have walked up and down the Avenue at least five times over all my visits. Over the years I have visited the Stones approx. twenty times but this was the first time I had walked the complex with other experienced dowsers many who had dowsed Avebury many, many more times than I had with several who had virtually lived there and who’s knowledge of the site was exceptional. Two of the exceptional dowsers are also authors, in Adrian Incledon –Webber and Nigel Twinn. it was difficult to know who had the most experience of Avebury because we also had several ladies who by their own admission had visited the site nearly every weekend for ‘years’ dowsing with the Spirit and energies of the site, while Both Nigel and Adrian had also lived very close to Avebury for multiple years and were regular investigators of one of the greatest Megalithic spiritual centre in the world along with Stonehenge which is only twenty miles away and part of the same landscape. Anyway, the Earth Energies weekend started on Saturday with two talks and workshops by Maria Wheatley and Christian Kyriacou both exceptional practitioners of their arts. First Bill Holding set the scene as Chairman of the Earth Energies group with a great introduction followed by Maria’s talk. Maria talked for well over an hour sharing her huge knowledge with the eager audience, she described the history of Geodetic energy investigation and how it came about which set the scene for what turned out to be some very profound discoveries of primary water (Genesis water), and what has been termed genesis energy with the manifestation of those primary energy lines on the surface of the Earth which she explains fully in her fabulous book ‘Divining Ancient sites’. Primary water is water that was contained in the very building blocks of the Earth, when the dust of space was collected by the swirling energies of interstellar space it also collected it’s percentage of all molecules that were available and this was also huge amounts of water which later fused into the very rocks of creation, this type of rock has been named ‘Ringwoodite minerals’ and predominately resides from about 700 miles and lower beneath the surface of the Earth. 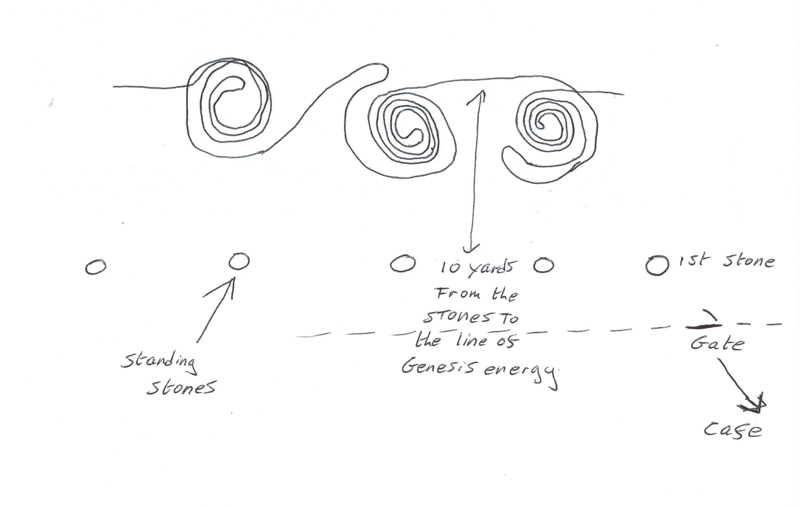 This type of underground water has curative properties and produces energies with a ‘ying/yang’ energy signature (opposite polarity’s) that run alongside each other with spiralling outcroppings, I was able to find these later at Avebury on the Sunday part of the EEG meeting and have produced a drawing depicting my findings (see below). Maria showed diagrams of these energy signatures with some very complex patterns including that when dowsing in the conventional way (water dowsing) that you will find twelve lines of force and not the normal six. This primary water or ‘H302’ water is strongly related and affected by the moon, the moons gravitational pull massages the crust of the Earth this strongly influences when the fractures are opened and Yin water is released driven upwards and released through Gaia’s heat and internal pressures, there is also suggestions that the Moons energy pattern affects this water as well. Maria then went on to talk about the Devil’s den stone, which has been identified as been the solitary remnant of a complex of Neolithic stones that were designed to highlight a Genesis energy line which is been generated by a deep fissure and uprising of primary water (Genesis water) . Maria later in the afternoon took us to the site of this Neolithic site, although first we did have the talk and work shop by Christian. Christian Kyriacou has a reputation for a deep understanding of spiritual energies and is known as the House whisperer for his skills in clearing resolving ill’s in a house, he is also a mean dowser although he used the dowsing rods purely as props for this talk, when it came to some demonstrations his explanation and creation of energy forms that were dowsable were quite memorable, so was his erasing of Bill holders energy transfer of a negative energy line, Christian explained that this was possible because that everything exists in the NOW and although there was a ‘timeline’ (things aged), all energy whether it is a Saracen stone a house or a negative energy line ‘imagined’ into life from three hundred miles away (which was dowsed by both Bill and Christian as existing in time and place in the hall we were all sitting in) existed in place forever unless erased deliberately, but of course as energy has consciousness it shouldn’t be erased, it is not OUR place to erase/destroy a consciousness out of misguided ego. Source or the Universe provides the spirit which imbues consciousness, this is getting a bit deep for the average dowser so I will terminate this path. Christian has just brought out his debut book ‘The House Whisperer’ and he went on to explain how in the forty years he has been clearing energies from houses he can recognise from the story of the house how the symptoms are manifested and with this knowledge and his ability he is able to re-program the house or landscape although referring back to his earlier discussion he prefers to work with architects so that new homes are not built in the wrong locations, or if a home is been generated from a building that had a different history of use this can cause energetic issues for the home owner. We the audience all had a go at creating energy forms that were dowsable and then we all searched for a spot in the room which we were not comfortable with, these sorts of energy spots can usually be found especially in public use buildings (like a hall) both Bill and I were drawn to the same spot and we both dowsed rising spiralling energy, instead of ‘destroying’ or erasing the energy Christian encouraged us all to ‘harmonise’ with the energy, I wasn’t sure what Bill did, but I checked that the energy was conscious (it was) so to make it simple, I befriended the rising vortice and it ceased to become a problem for me, in short we harmonised with each other. The energy which had come into being from an underground water line (spring) crossing another underground water line, this is a standard manifestation of rising vortices, they come and go due to various circumstances ‘recent rain’ can quite often cause a vortice to popup as new water cause’s underground springs to increase in flow which produces and allows the stronger energies to interfere with each other (as the underground water flows can be separated by a distance that normally doesn’t interfere with each other) This means that the energy generated and living with its own water ‘home’ can get agitated if it is knocked out of its balance and in this example cause a vortice to occur. This energy vortice was cheesed off and the energy was just miffed as my energy consciousness was cheesed off with it in return as well for its bad behaviour so the simple thing was to say ‘hi, lets be friends’ and our energies accommodated each other. This was a new concept to me, normally I would leave bad energy alone and move on as all consciousness has the right to survive and it never crossed my mind to befriend an awkward energy before, which is good growth for me. So all in all some great lessons provided and I think well learned. We all went for some lunch and when we came back we were to be taken by Maria to the Devils Den site. As dowsers and knowing that everything has consciousness (including the actual energy) we asked for permission when approaching the site before going about out investigative business, Maria had already pre-warned us what we shall find and generally in what areas to look but finding the stones seven spiralling rings and exit (or entry/doorway) was cool and requesting healing on each line which seemed to be delivered was a bonus and then it was time for me to check out the Genesis line which was of course much more than a just a titillation because it was a new concept (new energy/lifeform) and was also a manifestation of Gaia’s energy. Of course everything exists in its place already but as a dowser we have to ask a question to find something or have that special energetic skill of tuning into a feeling, in this case Maria had already used her skills to discover what exists so all we had to do was ask the question and allow our energetic-selfs to find what we wanted. Maria encouraged us to put away the dowsing rods and feel the energy and get to know it without the questions, in respect, to just allow our energetic self to dance with Gaia. The cap stone of this Dolman ‘like’ site had a nice deep concave dip on its underside, big enough to poke your head inside and with room to create a noise and feel its reverberation while again we could communicate with Gaia, I used my own song, which everyone also had a go on. It all ended too soon as the day was now beginning to draw in with long shadows and a chill wind picking up so we all drove back to the hall for the days de-brief. The second day was going to be a practical dowsing day at Avebury Stone circle and as I mentioned at the beginning Adrian was going to be leading the site walk as he planned to take us to all four Avenues after picking out some selected high points of the site. My interest was to discover if I could find any Geodetic energies and as I had visited Avebury and shown gratitude and homage on many occasions and had been shown or shared some special Avebury spirit moments, I was confident that I would be accepted and shown the Genesis energies, so after completing some of the walk with Adrian I got into spirit with the site and when ready looked for some Genesis water lines which I then asked if I could be shown any Genesis energy and I was taken on a dizzy little trip of what I could best describe of mini-labyrinth shape energy lines, I did a drawing on the site which I have copied (crudely) scanned and show at the bottom of this article. For a great visual experience of the Avebury complex, here is a montage of the Stones with the photos taken in december 2012 when the sun is low and the stones show their best face’s. I did do a little dowse for some Genesis energy but with very little time left and with other things to do, I only dowsed past five stones, I started to draw roughly what I found and I expect to be going back at some point to redo and extend what I discovered, this is not new as Maria Whitaker and others have already documentated the Genises energy lines at Avebury. Below is my rough hand drawing of the energy patterns I discovered, for a better understanding of the location of this section of Avebury that I dowsed, it is exactley the same as the phto used on this websites front page, from the far right where you see the gate. Pattern of energy at Avebury of a small section fof Energy.